Almost two years ago, Nigeria stood triumphant on South African soil, having vanquished all before them on the continent. It was quite the change from failing to qualify for the previous edition in Equatorial Guinea, and went completely against the grain of performances at continental level. In the grander scheme of things, that win should have marked a resurgence. It will instead look like some freakish spike in the graph. Nigeria are back at the foot of the mountain, on the outside looking in. The game that dealt the death blow was supposed to be the most benign of fixtures: at home against South Africa. No matter how low it got through the years, Nigeria could always count on a favourable outcome against the Rainbow Nation. Allied to this was that Bafana Bafana had secured qualification already, so had, in theory, nothing to play for in Uyo. What could possibly go wrong? Well, as it turned out, almost everything. Stephen Keshi made the expected alterations, all enforced: Raheem Lawal replaced Hope Akpan, stricken by injury, and Kenneth Omeruo came straight into the side for the suspended Godfrey Oboabona. The Middlesbrough man did not look at all fit, and was caught in possession for Bafana Bafana’s second goal. The replacements were like-for-like but the set-up was different. John Obi Mikel played as a No.10, while Ogenyi Onazi and Lawal held behind him in a 4-2-1-3, though neither is natural in such a role. The Chelsea man, meanwhile, has played increasingly advanced positions throughout the qualifiers, but this was escalation at its most extreme, the most complete opposite of his club persona. The surprise was that he did it quite well. He caused Dean Furman problems repeatedly, drawing the Bafana captain out of position and forcing him into clumsy fouls. The problem was no one was moving into the space vacated; Uche came short a couple of times, but his touch was persistently poor. The natural solution would have been for either of Lawal or Onazi to advance, but both seemed to over-compensate for their unsuitability to their deep roles by sitting too far back, even after possession had been consolidated. Team cohesion was broken; attempts to build attacks quickly collapsed. The Super Eagles had three excellent opportunities in the first half, all of which fell to Ahmed Musa. The first from when he won the ball in the centre circle, the second after a harmless ball was allowed to run through, and the third after Mikel turned quickly in midfield and slid him in. Tellingly, none came from any sustained possession or incisive build-up. The CSKA Moscow man failed to capitalise, but all three came from runs no one else in the team would have made. Even on a bad day, Musa remains invaluable. The South Africans were not particularly impressive either defensively or going forward. Too much relied on the fearless running of Tokelo Rantie. Shakes Mashaba instructs his team to defend in two very narrow banks of four, but it is as much a trap as a weakness: by encouraging the opposing full-backs forward, his two strikers can isolate the centre-backs and run at them. It is a risky strategy up against full-backs proficient in attack, but it was Efe Ambrose and Juwon Oshaniwa in Uyo, not Cafu and Roberto Carlos, so he just about got away with it. If ever there were a time to bemoan Nigeria’s options at full-back, this was it. The Ashdod man in particular had a poor game, slowing down attacks with poor control; the less said about Ambrose, the better. Elderson Echiejile, meanwhile, twiddled his thumbs on the bench. The opener predictably came via this route: Rantie pulled into the channel, shrugged off Lawal, sped past Azubuike Egwuekwe and finished beautifully. It was coming – the forward had wasted an opportunity earlier in the half when Omeruo gave away possession cheaply, firing over when a square pass was on. After the break, Rantie and Bongani Ndulula worked a lot harder to close the ball down. Whereas the Super Eagles were able to fire the ball into Mikel to tempt out Furman in the first half, they now struggled to play the initial pass out of defence, with the two forwards blocking passes into Onazi and Lawal. The second goal was a direct consequence as, seeking to play out from the back, Omeruo was muscled off the ball by the Bournemouth striker, who went round Vincent Enyeama to complete his double. As in the last two games, the introduction of Sone Aluko made an impact. The Hull City man picked the perfect time to open his goal account for the Super Eagles, but it was all too late. In other circumstances, the fight-back to tie at 2-2 would be applauded, but the news that Congo had done the business in Khartoum put paid to the ambitions of the African champions – a title they have meekly surrendered. 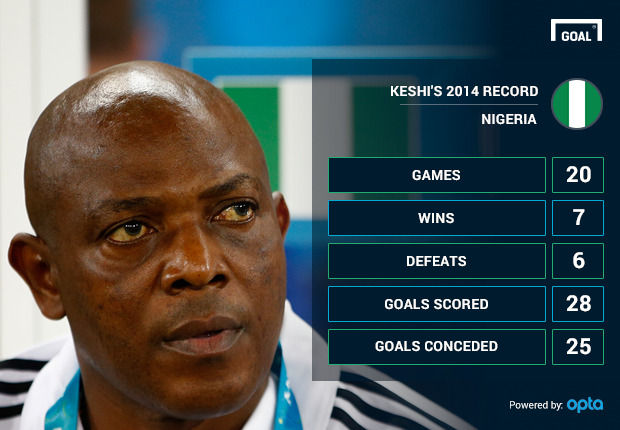 Keshi has run his course as coach now, surely. He took over a team that had failed to qualify for the 2012 Afcon in Equatorial Guinea and Gabon, and took them to the pinnacle of the continental game in just over a year. But the astounding highs of 2013 only make the abysmal failure of the latest campaign all the more tough to take.